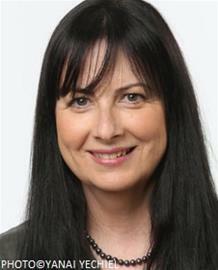 Ariella Goldminz was born in Tel Aviv in 1955. She grew up in Haifa and still resides there today. She has a BA in English literature and theater studies from the Hebrew University of Jerusalem and an MA in Hebrew and comparative literature from the University of Haifa. Goldminz has taught English at high school and worked as office manager for a hi-tech company. At present, she dedicates herself to writing. Relay Race, her first novel, won the Ministry of Culture Prize (2015).